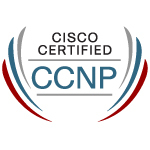 As you might see I passed the T-Shoot exam on August the 31 and I can proudly say that this exam leads me to a very well respected certification of Cisco, the CCNP. It’s been a journey of at least 1 year and half since I began the studies and preparations for the CCNP, and finally I got it. The presure I put to myself, the time I spent, days and nights of reading and labbing paid off at the end. The Route exam was the first I took and it was a quite challenging exam (the best one) where I spent about 7 months just to grasp all the difficulties and details of every protocol and technology involved on it. After the summer holidays of 2011, I decided to go for BGP (CCIP) exam which took me about 3 months to prepare the best way I could, and in January the 31-st I passed it, some week’s later came an Official Notification from Cisco that the CCIP is going to be retired (oops, this means $200 gone for nothing..?? ), well, at least I got a lot of knowledge and filled my gaps about BGP (which in turn, made me feel more confident when I got trouble on BGP at work ). During February and August I was going after the Switch and T-shoot preparations, nothing new on them, just more detailed and deeper explanation about the technologies and protocols used, but Im not that satisfied with it, especially with the Switch OCG book, had a lot of lack of info’s in specific protocols eventhough it’s meant to be the first preparation step to the CCIE. As I noted on the last post I passed the Switch on (July) Friday the 13-th , and a month later the T-Shoot. Had a lot of fun with INE’s video trainings, very well and informative explanation from them, a really good source for all CCNP wannabe’s. ← Friday the 13-th obviously a lucky day, at least for me..